In construction, understanding the latest, most efficient technologies and building methods is key to success... not to mention high levels of skill and familiarity with those methods, and an engineering staff that’s always ready to create high-quality building components at scale. By using Cold Formed Steel (CFS) and following best practices for building with it, teams can stay as prepared as possible for the challenges of modern residential, commercial, and industrial facilities. Since the mid-19th century, CFS has been relied upon in American and British construction. CFS is used in China and South East Asia for cost-effective, reliable dwellings; in various parts of Africa where skilled labour and housing shortages are a reality; and in Australia and New Zealand as a reliable and more flexible alternative to timber. All around the world, Cold Formed Steel is proving to be the ultimate versatile construction asset. Should your team use CFS roof trusses? The answer depends on numerous factors. 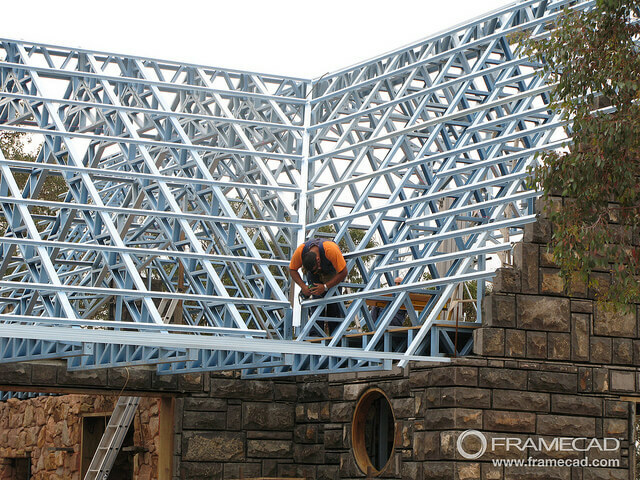 Every construction business has unique priorities — but if you want to be on the cutting edge of building practices and you want to modernise your capabilities, it’s well worth looking at CFS for structural components, and especially for roof trusses. Cold Formed Steel components are carefully designed with the aid of state-of-the-art software, such as FRAMECAD Structure and FRAMECAD Detailer. These software applications allow for real-time engineering, precise detailing, and versatile design of CFS roof trusses and other structures. By using these tools, construction firms can quickly and efficiently produce roof trusses of many complexities for building projects. Every different project comes with its own set of demands. CFS components can be produced in a wide range of thicknesses and sizes, while remaining dependable due to the material’s inherent strength. Engineers working with CFS are therefore better able to deliver on diverse project requirements, without having to work around the limitations of less-capable materials. Cold Formed Steel is not susceptible to damage from water, mould, or termites. It is recyclable, doesn’t require treatment with harsh, hazardous chemicals. CFS is, overall, a longer-lasting, more dependable solution than timber. Drying time and waste can increase both the cost and the duration of a project. Building with CFS largely gets rid of those issues. The creation of CFS profiles is very predictable and streamlined, allowing project managers to know exactly how long production and delivery will take. Waste is minimized, because the precision equipment used to make CFS parts ensures fewer errors are made. The process of making CFS parts, along with reliable equipment and onsite assembly support, keeps all stakeholders on the same page. By incorporating CFS into project plans from the beginning, a highly-satisfying design becomes much more achievable. Because structural CFS opens up possibilities in building concept and style, clients can be involved from the start with engineers and architects in order to execute a unique vision. Click here to view our case studies to see a diverse range of steel manufacturing projects across the world. CFS has the advantage of being lightweight, yet very durable. This makes it a unique asset in areas prone to earthquakes, as it helps ensure future occupant safety. Precision engineering, down to the millimetre: that’s what CFS offers. Today’s manufacturing systems and software can yield the right Cold Formed Steel parts consistently and quickly. This ultimately saves on engineering costs, speeds up delivery of materials while shortening timelines, and reduces the chance of errors that cause budget blowouts. Because CFS is not flammable, it helps protect workers while construction is in progress, as well as future occupants or residents of the finished building. If you want the above advantages in construction, you should strongly consider making your roof trusses with Cold Formed Steel. The best way to go about it is with a complete, end-to-end process — one that takes you from conceptual design all the way to engineering and onsite installation. FRAMECAD provide the advanced software, manufacturing systems, and professional support to help you realise all the benefits of Cold Formed Steel construction. If you’re ready to add superior roof trusses to your construction capabilities, get in touch with FRAMECAD’s experts today.